In their book Married With Cancer, Eileen and Jimmy Newell share how they coped as a couple through their cancer diagnoses and treatments, both as patient and caregiver. They’ve had boundless love and laughter, some tears, and a few life lessons, which they share in this book to give hope and encouragement to their readers as they make their own journey toward survival. 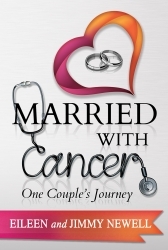 Bradenton, FL, October 02, 2018 --(PR.com)-- IndieGo Publishing is proud to announce the release of "Married With Cancer: One Couple's Journey," by Eileen Newell and Jimmy Newell, as a paperback (9781946824288), a hardcover edition (9781946824295), and as an ebook (9781946824301). This book celebrates Breast Cancer Awareness Month and every day of the year. Its message is a timeless one of hope and courage, love and bravery, and surviving by living each day to the fullest. Eileen and Jimmy Newell were both born and raised in the Bronx. Jimmy studied History and eventually Law at Saint John’s University, and Eileen fulfilled her dream of becoming a nurse by studying at Saint Vincent’s School of Nursing in Greenwich Village. Jimmy’s career was primarily in education, first as a teacher and then as a Director of Financial Aid at a number of New York area schools including Columbia University, Mount Sinai School of Medicine, and Downstate Medical Center. He started his blog, The Newell Post, in 2013, and published his first book, "A Bronx Boy’s Tale," the same year. Eileen has been a nurse for forty-three years, a very fulfilling career, and she enjoys cooking, shopping, reading, and writing. They are now retired and enjoying the Florida lifestyle. The reviews of Married With Cancer have been outstanding. Reviewer and fellow nurse Pat Lowenwirth captures the essence of the book when she states, "This is a thought provoking book written with an underlying message of humor and an abundance of love. It’s filled with authentic experiences that take you along with Jimmy and Eileen on their cancer journey, a path filled with pain, compassion, wisdom, poignant connections and incredible insights." The authors state, "Though we may differ in style and, at times, subject matter, I think we have accomplished our purpose for writing this book — to illustrate the importance of family, friends, and healthcare providers who make you feel it is their life’s mission to make your day. We also hope to reveal the intimate moments of joy and pain, struggles and small victories of being a married couple with cancer. We hope that our story will encourage others waging their own battle of survival." "Married With Cancer: One Couple's Journey" is available for wholesale purchase from Ingram Book Group as a paperback and hardback, and as an ebook with Amazon.com and other book retailers worldwide where all good books are sold. You may also contact IndieGo Publishing at indiegopublishing@gmail.com.